Identifying the signature on a Japanese print can be difficult as Japanese prints contain many marks. The signature can contain a series of figures. However the signature may not refer strictly to the artist, but the artist's studio. There are special symbols for students, indications of who the individual studied under and more. There are also many prints that are unsigned. It can take some time to determine where the signature is on the print. You will need to have an understanding of Japanese characters. Look for a combination of characters that are arranged in vertical groups. Many times the signature will only have one vertical group. The signature is read from top to bottom and right to left. Search for an artists' seal in place of a grouping of vertical characters. This is similar to a writers seal and will contain a distinctive mark or design that is used in place of the artist's signature. Identify the common prefixes and suffixes used with signatures. Many artists will use the "go aratame" before the name, which translates to "changing to." This is common as many artists will change the name used for the signature. The character "oju" is used as a prefix to show that the piece was requested. 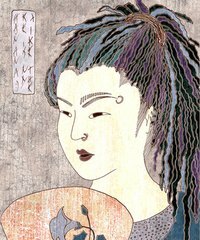 The character "ga" or "hitsu" is used after the signature as this means "picture by" or "painted by." Looking for these prefixes and suffixes can help distinguish where the signature is located. Viewing Japanese Prints: FAQ: How do we interpret inscriptions and seals?